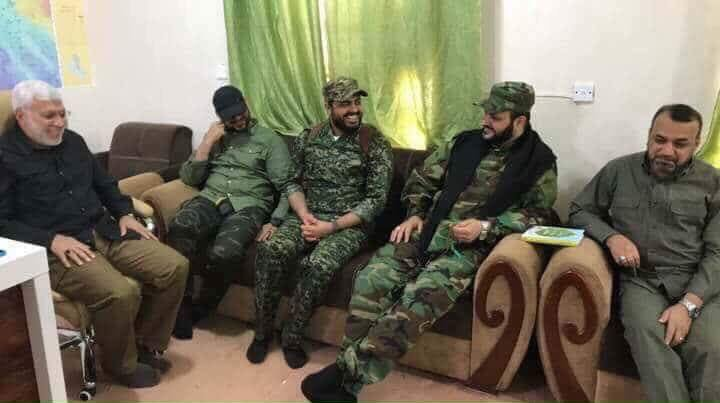 Qais Qazali (center), the leader of Asaib al Haq, and Akram al Kaabi (center-right), the commander of Harakat al Nujaba, meet outside of Hawija to discuss operations to retake the town. The Iraqi military and Iranian-supported Shia militias have retaken the town of Hawija from the Islamic State just two weeks after launching an offensive, leaving the Islamic State with just one major stronghold in Iraq. The Islamic State had controlled Haija since early 2014. The Iraqi military and Iranian-backed militias that operate under the aegis of the Popular Mobilization Forces launched the offensive to regain control of the town from the south and west on Sept. 21. The joint forces rapidly advanced across the Hamrin Mountains and reached the center of Hawija. Islamic State forces still control a small pocket of villages to the north and east of the town, but are now surrounded. Hawija was the Islamic State’s last major stronghold in northern Iraq. The Islamic State maintained control of the town even after it was ejected from the nearby cities of Tikrit, Baiji, Al Qayyarah and Mosul over the past year. The Islamic State appears to have put up a minimal fight to defend Hawija. It may be an indication that its combat power is largely tapped in northern Iraq. However, the jihadist group may have withdrew the bulk of its forces to live to fight another day. The Islamic State’s last bastion in Iraq is along the western branch of the Euphrates River Valley, from the towns of Anah and Rawa to al Qaim on the Syrian border. The Islamic State also holds territory along the Euphrates on the Syrian side of the border. Its leadership appears to have regrouped in Mayadin. Like previous operations to retake cities and towns from the Islamic State, the Iraqi government has relied on the Popular Mobilization Forces (PMF), the grouping of militias mostly backed by Iran, for support. Iranian-linked militias have played a key role in liberating cities such as Mosul, Ramadi, Fallujah, Tikrit and Baiji. The top PMF leaders are Iranian proxies. The PMF’s operational leader is Abu Mahdi al Muhandis, a former commander in the Badr Organization who was listed by the US government as a specially designated global terrorist in July 2009. The US government described Muhandis, whose real name is Jamal Jaafar Mohammed, as “an advisor to Qassem Soleimani,” the head of the Islamic Revolutionary Guards Corps – Qods Force, Iran’s expeditionary special forces. Hadi al Ameri, the head of the Badr Organization who has been close to Iran for decades, is also a key leader in the PMF. At least two Iranian-supported militias, Harakat al Nujaba and Asaib al Haq, have been spotted on the Hawija front. Qais Qazali, the leader of Asaib al Haq, and Akram al Kaabi, the secretary general of Harakat al Nujaba, have been photographed outside of Hawija discussing their militia’s role in the Hawija offensive. Both groups are Iranian proxies and their leaders are close to Qods Force commander Soleimani. Qazali is listed by the US as a specially designated global terrorist, while Kaabi has been designated by US as threat to Iraq. Both Qazali and Kaabi have threatened the United States and Kaabi has said he would overthrow the Iraqi government if ordered to do so by Iran’s Supreme Leader. The PMF has become an important branch of Iraq’s security apparatus. The Iraqi government officially incorporated the PMF as an “independent military formation” that reported directly to the prime minister in July 2016. The PMF was established as a parallel security organization akin to Iran’s Islamic Revolutionary Guards Corps. The move was hailed by Iranian Supreme Leader Ali Khamenei as an “important and blessed phenomenon,” while Iranian generals have said that the PMF is an extension of Iran’s plan to export the revolution. Kaabi, the secretary general of Harakat al Nujaba and aligned with the Iraqi forces fighting Isis in Hawija, has been designated as a threat to Iraq by the Yanks. But Kaobi openly says that he would overthrow the Iraqi government if ordered to do so by the Iranians. Bush has been responsible for getting the Americans slapped around all over the Middle East. Maybe serves them right that Saddam’s ghost haunts them in some form or the other. ISIS is finished as an organized force in Iraq. Any heavy weaponry and armor has been transferred to the desert hideouts in Syria. There are a few pockets and roaming bands of the jihadis left and those are being methodically eliminated. The Coalition has succeeded in their mission to end ISIS control in Iraq. However, the damage caused by ISIS to Iraq and the entire area can never be repaired. ISIS in Syria is still live and kicking. It looks like the Russians and the SAA are going to have to fight it out with ISIS in the desert from Palmyra to the Euphrates. That may take some time as the Russians are still trying to prop up Assad as cheaply as they can. But there are oilfields involved so it will get done ,eventually. So once ISIS is removed as a player on the battlefield that’s when the real games begin. Who’s fighting who? Are we still training the Shia army? Like I didn’t see this coming..? I was in Hawija when AQIZ did just that in late 2007. All of a sudden things went quiet; the surge had succeeded. What will ISIS become? Has the money for jihad dried up all of a sudden? All these guys did was take a break and go home. In Hawija they don’t have far to go to get there, probably just around the block. DEBKAfile’s military sources dispute the Iraqi prime minister Haydar al-Abadi’s claim that his army vanquished ISIS in a two-week offensive to liberate the town of Hawija near Kirkuk. Our sources reveal that, instead of launching this offensive, Iraqi army commanders negotiated a deal with the jihadists through the mediation of local Arab tribes. They granted safe passage for the occupiers and their families to withdraw from Hawija, in return for a commitment not to resist the Iraqi army’s takeover of the town. Iraqi troops indeed secured a corridor for their exit, after which the Islamic fighters headed for Diyala in eastern Iraq near the Iranian border.